Feb. 5, 2013, 9 a.m.
Social media editors: Do you have a robot deputy? How an algorithm could change your newsroom’s social publishing strategy. By Adrienne LaFrance @adriennelaf Feb. 5, 2013, 9 a.m. It was only about a year ago that Liz Heron — then a social media editor at The New York Times, now in a similar role at The Wall Street Journal — predicted her job title wouldn’t exist in five years. As more people in any given newsroom are publishing to social platforms — and as more people bypass the homepage and instead use Twitter and Facebook as the entry point to any given news site — analytics companies see new opportunities to help media companies leverage real-time social data. Visual Revenue, a predictive analytics firm that focuses exclusively on media companies, is this morning rolling out a bundle of tools to help editors measure the effectiveness of social publishing in real time. More importantly: Once news organizations can precisely measure the effectiveness of their social publishing habits, how will that highlight how their social publishing behaviors ought to change? Visual Revenue is already working with companies like The Atlantic, USA Today, NBC, Forbes, and dozens of others, using data about those sites’ audiences to help them determine optimal publishing frequency, how regularly to switch stories featured on the homepage, when to try a new headline for a story that isn’t doing as well as expected, and so on. 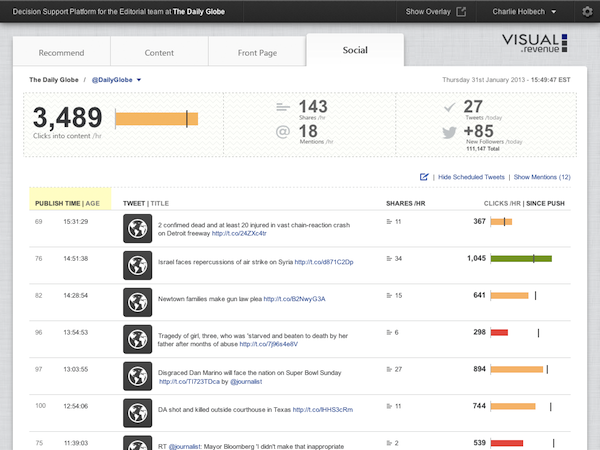 There are other companies — SocialFlow and Gnip come to mind — that deal in real-time social data. Visual Revenue likes to say it’s in a class of its own because it focuses exclusively on the needs of news clients. What works for one news organization won’t for another, and that’s largely because audiences are as fractured as ever. And yet the behaviors of any given audience are undergoing dramatic changes. But there are some constants. Across the board, tweeting more is better than not tweeting enough but tweeting all at once is worse than not tweeting at all. The exception to the more-is-more rule is when news organizations tweet or publish to Facebook in concentrated, often-automated bursts. “There tends to be some penalty for clustering together your pushes,” Mortensen said. A true breaking-news destination can get away with more rapid-fire tweeting than magazines, which do better when they let at least 20 or 30 minutes lapse before tweeting again, he said. Where Visual Revenue believes it can add real value is in being able to recommend specific actions within an editorial framework outlined by the organization — that is, using an algorithm to tell a newsroom when it should tweet and also what it should be tweeting. Mortensen likens these computerized suggestions to the role of a deputy editor: Someone who knows the editorial values of the paper, and can determine the best publishing strategy as a result. Except, in this case, that someone is a robot. Another upshot: Non-humans aren’t tethered to print-era concepts that have bled into an online era of publishing. 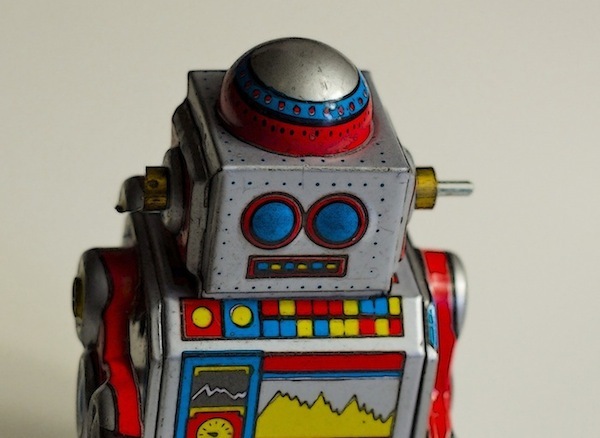 A robot doesn’t care about newsroom culture or tradition; it only cares about the data. Mortensen says before The New York Daily News started working with Visual Revenue, it was updating its homepage about 80 times a day whereas today, it updates about 160 times a day. He expects real-time social analytics will inspire similar changes to publishing habits. Photo by David DeHetre used under a Creative Commons license. POSTED Feb. 5, 2013, 9 a.m.
LaFrance, Adrienne. "Social media editors: Do you have a robot deputy?." Nieman Journalism Lab. Nieman Foundation for Journalism at Harvard, 5 Feb. 2013. Web. 20 Apr. 2019. LaFrance, Adrienne. "Social media editors: Do you have a robot deputy?." Nieman Journalism Lab. Last modified February 5, 2013. Accessed April 20, 2019. https://www.niemanlab.org/2013/02/social-media-editors-do-you-have-a-robot-deputy/. | title = Social media editors: Do you have a robot deputy?